Once, as a young child bored on a cold, grey beach on the barely-acceptable coast of southern England, I saw a tiny stream of water flowing from a tide pool back into the sea. Armed with just a bucket and my two hands I decided to become the god of this small world. I took handfuls of sand and placed them over the craggy rocks to divert the flow down new paths, I dammed the whole stream and watched the water spill out into new rivulets, and finally when it was time to go I looked back and saw the effect I’d had on this realm of mine – from one small channel of water I had made lakes, waterfalls, and whole diverging rivers. One of the worst things about growing up is that you’re expected to pretend more and more often that you don’t want to play in the sand, that you don’t want to spend a day exploring a set of woods, building forts out of sticks and logs, and that you don’t want make and reshape islands out of the bubbles in your bubble bath. One day I’ll use my children as an excuse to brazenly do these kinds of things again, but in the meantime From Dust is a wonderful substitute. It’s a game that takes this childlike drive to experiment and reshape nature and allows adults to experience it without facing the kinds of looks a fully-grown man sitting in a log fort typically receives. You play as a god of a small tribe that’s trying to follow in the footsteps of their ancestors, who left their homeland and took great power to reshape the earth with them. Throughout the game you steadily rediscover this lost power and make use of it to protect the people and help them continue their journey. Your basic power allows you to draw up a great chunk of matter, move it about, and place it somewhere else. This may involve picking up a mass of earth and using it to dam the source of a river, sucking up water and dropping it on a forest fire, or taking molten lava from an erupting volcano and cooling it in the ocean to build a footpath from one island to another. These basic interactions, picking up and relocating earth, lava, and water, form the core of your experience. As you progress in the game you unlock new powers that can radically alter how you interact with the environment. One temporarily solidifies all the water in a stage, for instance, while another evaporates the water, leaving riverbeds and lakes dried up for a short time. Each has its own use, and you’re free to experiment with them at your leisure. The game is divided into discreet stages, each containing a passage leading into the next. This pathway is sealed at first, and to unlock it the tribe must activate all the totems in the area. You can order members of your tribe to travel to a totem, and by activating the totem the people form a small village around it. Most totems grant you a new power to use in that stage, so long as the village isn’t destroyed by the elements. Some are in hard to reach areas – at the bottom of a lake, on top of an inaccessible mountain – and some are in dangerous locations – in the shadow of an active volcano, on the shore of an island periodically hit by tsunamis – and it’s your job to make sure that your people reach them and maintain them safely. To do this you simply use your available powers to reshape the land. The real joy in From Dust doesn’t hit you until a good while into the game. At first you may just plough through stages using the same methods over and over again, and the game will seem a little disappointing. It’s undeniably fiddly, and there are a good number of technical annoyances to boot. For instance, when directed to go some place the members of your tribe might take an unnecessarily long route, or get stuck on a gentle incline and refuse to move for no good reason. Drawing up and setting down matter is also more cumbersome than it needs to be, and it never really feels like you’re able to pick up enough quickly enough. Unfortunately the game simply doesn’t do enough to lend your actions a satisfying tactile friction, and so it’s only the effects of your actions, not the actions themselves, that are compelling. Precise activities such as building a bridge out of cooling lava, or removing small puddles of water in order to place a totem on fully dry land, are often frustrating, in part because the camera itself doesn’t make it entirely clear exactly where on the map your cursor is. And the camera as a whole is simply unsatisfying – it’s a static affair of being either zoomed all the way in or out, whilst the requirements of the game, and the wonderful detail in the game’s environments, call out for a camera you can move about and angle freely. So, what’s so special about the game – why does it rise above the interface hiccups and technical oversights? In a word: emergence. The relatively simple interactions between the elements in From Dust conspire together to lead to impressive complexity. A volcano may erupt, spilling lava down into the sea so that it cools and completely alters the layout of the land. Plants grow and spread so long as earth is supplied with water, and from a single village flora can spread across an entire level, climbing over mountains, clumping around lakes, and crossing land bridges you construct to colonise distant islands. Fire spreads as lava reaches forests. Rivers spring up from underground sources as you remove earth and find paths to the sea, or form lakes based on the topography of the surrounding region. Once you start to notice all this the game has a tendency to alter your way of thinking about it. You stop building bridge after dirt bridge to reach all the totems in the level as fast as possible, and instead you start to play around with all the elements in your chemistry kit, all the sand in your sandbox. You wonder if you can use lava to divert the flow of a huge river, if you can force rivers into volcanoes to neutralise their danger, and you immediately go about testing these ideas out. The game stops being a rather humdrum matter of escorting AI with pathfinding problems and becomes a playground where everything can change, with or without your input, in significant and visually arresting ways. And yes, the game looks incredible. The artistic style – approaching photorealism before veering off at the last minute – is wonderful almost without exception. Everything that happens looks impressive, and since almost everything that happens in the game is unscripted, this is all the more impressive. Certainly, it’s not perfect – the edges of the map are marked by odd and unnecessarily visible lines, characters sometimes move over terrain in a shonky fashion, and tsunamis lack a certain visual fluidity – but this is by far one of the most beautiful games of the year. From Dust gives us a sandbox and asks us to play, and several levels, especially towards the end, give you inspired conditions to work in. One puts you in a barren desert where hundreds of little sources of water lie under the sand, ready to spring up wherever you remove earth, leading to a swiftly changing landscape of bubbling rivers, pooling lakes, and flourishing plant-life. Another places you in the caldera of a giant volcano where lava periodically floods the area, leading to constant, varying efforts to get your people to higher ground. While not all levels are as clever each offers you the opportunity to find new ways of sculpting the landscape in useful or merely entertaining ways. The game ends with perhaps my favourite sequence in a videogame this year – after hours of playing a small-time god that can only alter, not create, you’re faced with a blank stretch of sea and left to your own devices. Suddenly, instead of merely being able to pick up and move pre-existing matter you can create from nothing. With the press of a button land rises from the sea. You raise mountains, carve out valleys, tell fresh spring water to shoot out of the ground. You can call forth plants or sweep the land into a barren desert. You summon volcanoes and tidal waves and sink whole islands into the sea forever. All this for your own pleasure, with no directions or goal. It’s the perfect ending to a game about being a God, about being a child playing with sand and water on the beach. It takes you back to that young dream of sculpting nature to your liking and reintroduces you to the pleasure of unstructured play, the joy of emergence, that is all too easy to forget. 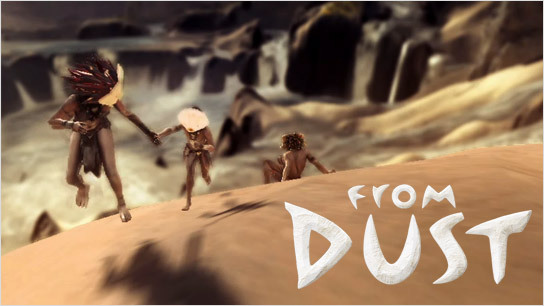 This entry was posted in Games Blather and tagged Eric Chahi, From Dust, Games of 2011, Review, Ubisoft Montpellier. Bookmark the permalink.